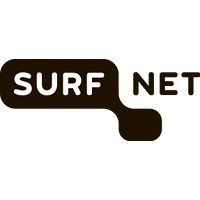 Profile: SURFnet is the National Research and Education Network in The Netherlands, and provides innovative and high bandwidth network services to the higher education and research sector. Since it was established in 1986, SURFnet has been at the forefront of networking in The Netherlands and internationally, and remains a key player in the Dutch Internet community to this day. The eighth generation of its network, SURFnet8, provides a high degree of network automation through cutting edge technologies such as SDN and NFV. On the optical layer, SURFnet8’s core network provides link speeds up to 400Gbit/s. In terms of security research, SURFnet is uniquely positioned in The Netherlands. SURFnet’s ”Thunderlab” research facility provides a dedicated high-bandwidth experimental network set up specifically to perform security research. This network, with a 100Gbit/s uplink to the SURFnet core and direct connectivity to AMS-IX, the world’s largest Internet exchange, has been used to perform in-depth studies of DDoS attacks. This unique asset will be a key contribution to the CONCORDIA consortium. Expertise and Role in CONCORDIA: SNET will provide the SURFnet’s ”Thunderlab” research facility that provides a dedicated high-bandwidth experimental network set up specifically to perform security research. Using this research network, in-depth studies on DDoS attacks can be made. Thus SNET will participate in all relevant WPs research activities focusing on the economics of DDoS attacks and possible DDoS attack countermeasures as well as Botnet take down legaly actions to be taken. In addition to providing the unique ”Thunderlab” facility to security researchers, SURFnet has a long tradition of direct collaboration with academic research groups, in The Netherlands as well as throughout Europe and the rest of the world. SURFnet’s long-running Research-on-Networks programme has been funding cutting edge network research for well over 15 years.